Dr. Rodney Brown was born and raised in Ontario, Canada. 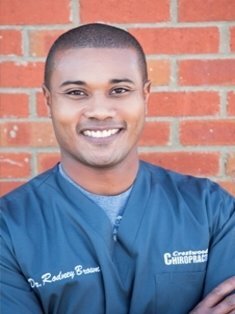 After receiving chiropractic care for an injury in university, Dr. Brown decided this was the career he wanted to pursue. After completing his Bachelor of Science degree from the University of Waterloo, in Ontario, Dr. Brown headed to Logan Chiropractic College, in St. Louis, Missouri. Dr. Brown married his high school sweetheart, Tegan, in his second year of Chiropractic College and moved home to Canada to complete his degree at the Canadian Memorial Chiropractor College, in Toronto – graduating in 1999. After settling close to extended family and building a chiropractic business in Guelph, Ontario, for five years, Dr. Brown decided he had had enough of the cold Canadian weather and moved south of the border with his family. He, his wife and his two children, Quinn and Dante, have called Crestwood home since 2005. Dr. Brown opened Crestwood Chiropractic in March of 2005. His family friendly office has grown significantly over time! Dr. Brown’s mission since the beginning has been to ensure that each and every one of his patients received the “Disney” experience at his office. He provides a variety of chiropractic adjustment techniques depending on his patients’ needs, including both hands-on manipulations and hand-held instruments. Our newest addition is an expansion that was completed in July of 2016. Dr. Brown is now able to help even more people reach optimal health in the expanded space! The expansion has allowed our office to introduce more services to be used in conjunction to the exceptional chiropractic care we have been providing.